Crop type coverage mapping (to degree possible through automated method-depending on region specific calibration)? What is the crop specific acreage? How did the crop acreage change over time? 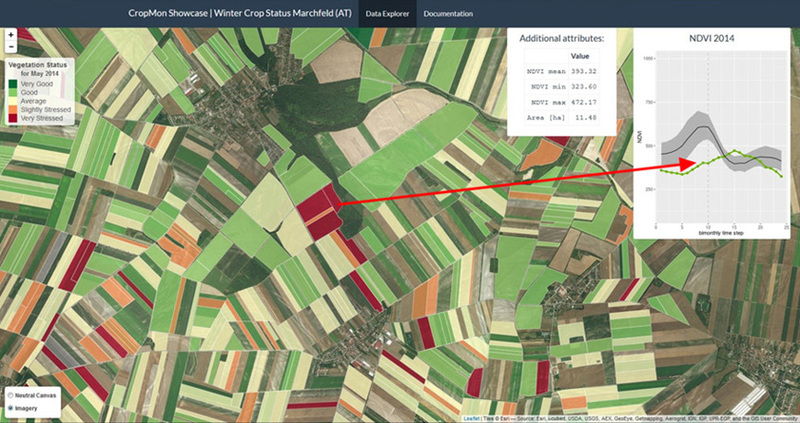 This service maps crop extents and types for providing the baseline information to enable crop and grassland monitoring. It delivers an accurate location and acreage of the production, as well as a generation of a systematic and repetitive coverage. What is the actual state and condition of crops in comparison to history? What is their variation over time? What is the individual field crop rotation cycle? A service suitable for the identification of crop growing condition status as well as to monitor crop and grass condition over time. By delivering an effective and efficient monitoring and managing of agricultural practices it enables an improved strategy and decision making by prioritizing actions as well as selecting und upscaling of successful practices. 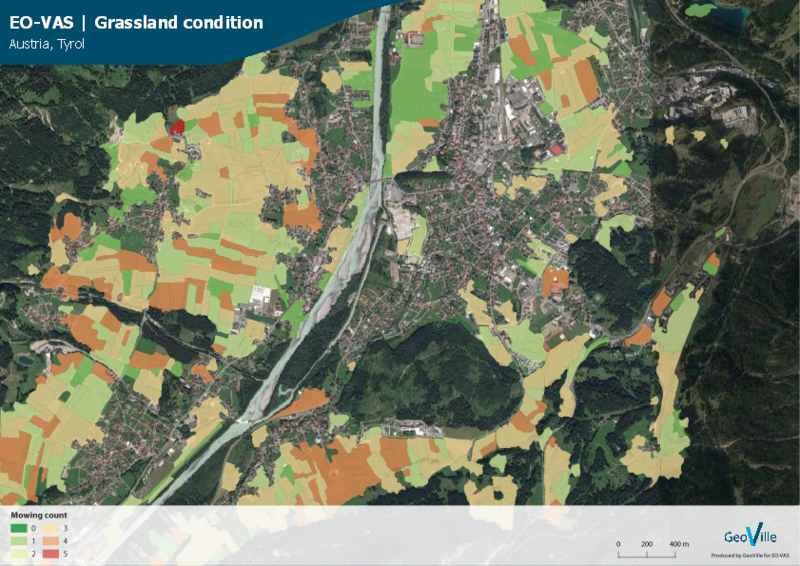 A service that identifies Grassland regions through a sophisticated combination of biophysical indices. The growing status can be calculated as well as the Intensity of usage, which is indicated for example by Mowing counts. 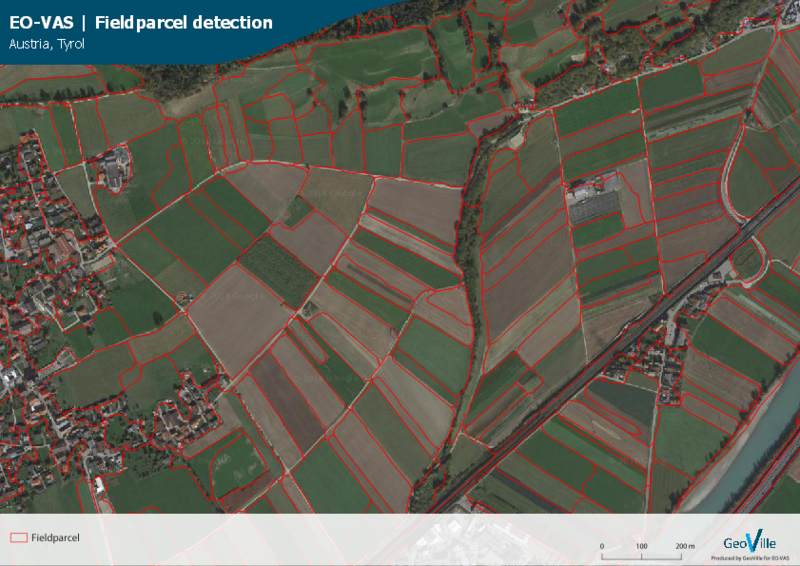 An automatic service to detect field parcel boundaries on the basis of Sentinel-2 time-series imagery is provided. You can select an area of interest in a region with high agricultural activity, then you define the time-frame of data that should be considered. It returns a vector-file with the derived field parcels. The service is optimized for agriculture purposes. Project has received funding from European Union's Horizon 2020 Research and Innovation Programme under the Grant Agreement 755899. Disclaimer: Views expressed on this website are those of the individuals, partners or the consortium and do not represent the opinion of the community.